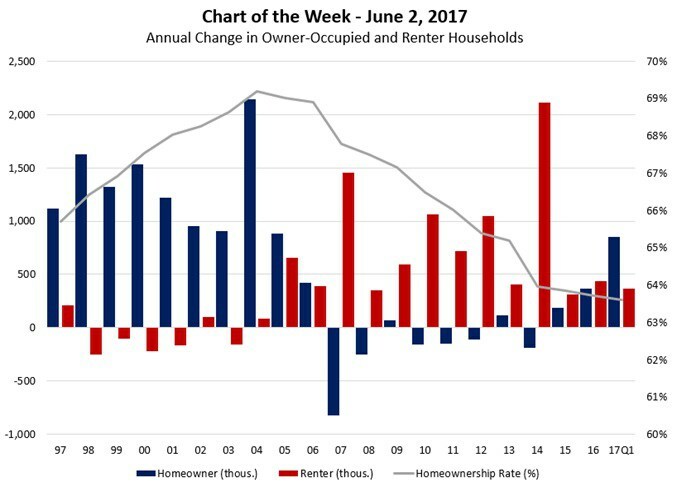 A recent "chart of the week" from the Mortgage Bankers Association (using Census data) shows that owner-occupied households ratcheted up in Q1 2017 by 1.2 million households, when compared to same period in 2016. This surge marked the largest year over year increase in owner-occupied households in the post-recession period. Interestingly, up until a couple years ago, household formation was dominated by growth in the rental sector. Take a closer look at the chart below (especially Q4 2006 – Q1 2007) and you can literally see the effects of the housing crisis.